Thought provoking, realistic, and highly emotive; This War of Mine: The Little Ones, on PS4, is the ultimate survival game. Inspired by true events, The Little Ones explores war from a whole a new hellish perspective; from that of a child. In a besieged town where food is scarce, medicine hard to come by, and life at constant risk, how far would you go to survive another day? 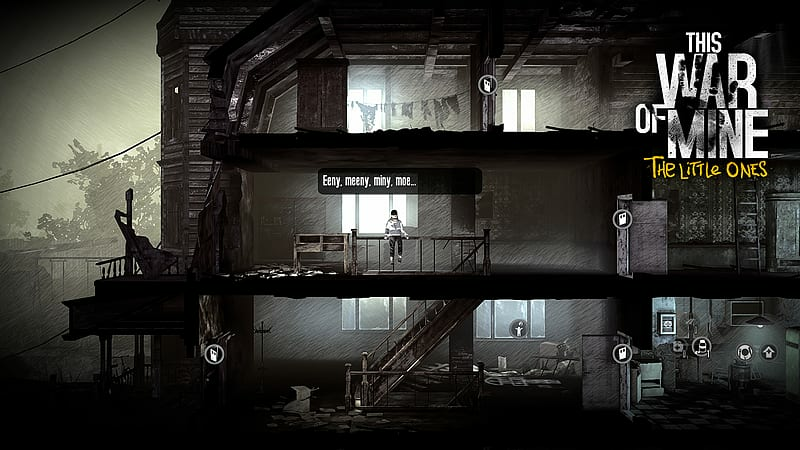 A harrowing tale of true survival set amongst the desolation of a besieged city, the critically acclaimed and multiple award-winning This War Of Mine pushed players beyond their comfort zone and redefined a whole genre. 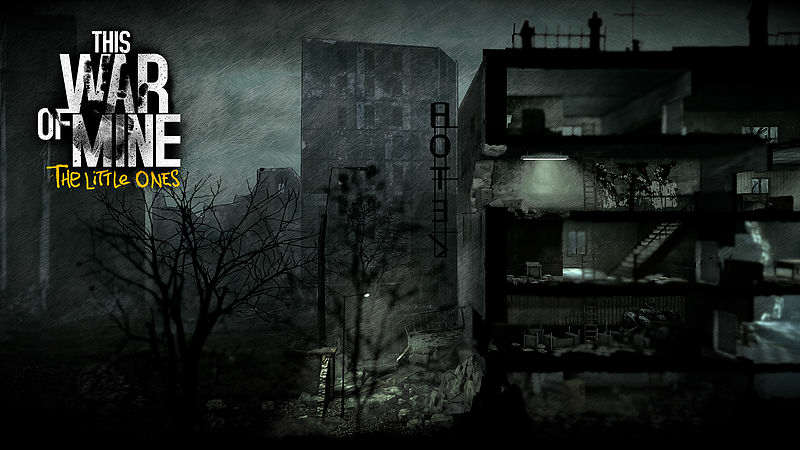 Now, get ready for This War Of Mine: The Little Ones, the definitive edition of the globally-praised phenomenon, set to once again challenge and inspire a generation of gamers. Releasing on PlayStation 4 and Xbox One in 2016, The Little Ones will remix the lauded survival-strategy of This War Of Mine with the addition of children. These new characters form the basis for a wealth of new strategic gameplay and emotional narrative content added to the celebrated original game. As you’re charged with protecting and preserving the innocence of youth, the harsh realities of life within the war-torn landscape will come more sharply into focus. The Little Ones offers a unique perspective on war through the eyes of a child, where players create new emotional bonds within a thought-provoking and expanded narrative. 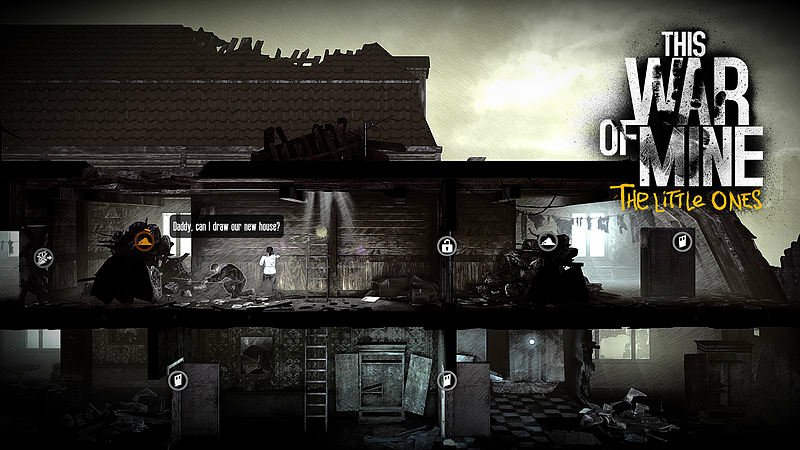 This War Of Mine: The Little Ones promises a gritty, dramatic and emotional journey through the experience of war. Not from an elite’s soldier’s point of view, but rather from a group of everyday men, women and children struggling to live against such horrific conditions. Struggling with a lack of food, limited or no medical supplies and under the threat of constant danger from the world around, players will need to make life-or-death decisions just to make it through another day. 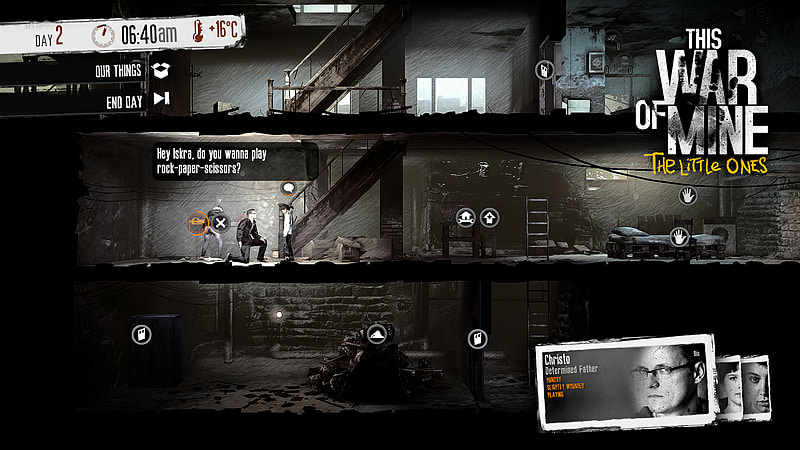 Arriving for the first time on consoles, This War Of Mine: The Little Ones translates the survival experience to PlayStation 4 and Xbox One, completely retooled for new-gen gaming. 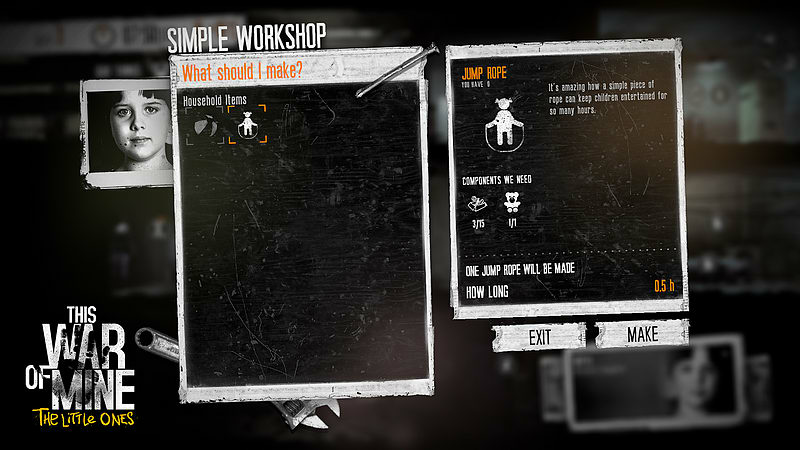 As hidden snipers prevent you from leaving your refuge, spend your days taking care of your fellow civilians in your hideout by crafting essential survival tools. Choose to play a randomised world and characters every time you start a new game, take on pre-defined scenarios, or even create your own scenarios and characters!